A few days ago, I asked a question which got closed for being too basic. When I tried to improve it, it got silently deleted (which implies disappearing from historical records as well), apparently because I should not improve a closed question or I should not significantly change it (I was not aware of this rule and was under the impression that improving was a good thing. See also this post. I thought, maybe if I ask the improved question as a separate question, it will be acceptable, so I reposted it as a separate question. At least I think I did, but now I can't find it anywhere. There is no way for me to tell, due to the vanishing commisar style in which deletion is implemented at Stack Exchange (which I think is utterly disgraceful). These are all your posts. The darker background color signifies a post that has been deleted. In your profile, deleted posts are only visible to mods and devs, but any 10k user can see them in the 10k tools or access them directly if they have the URL (or really just the question ID), which was supplied in your previous meta question you mention. 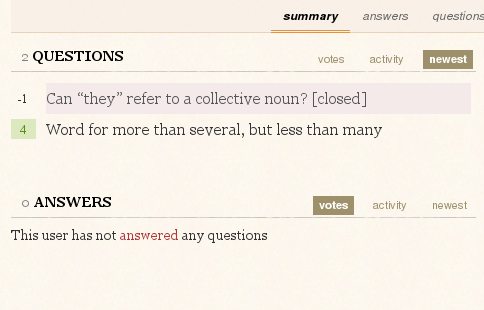 In fact you accepted an answer there that quotes your deleted question in its entirety. So you know for a fact that the question has not disappeared from historical records. Poor Mr Yezhov does not deserve to be dragged into this. Users need 10k to be able to cast delete votes at all. Users need 20k to be able to cast a delete vote immediately. Below 20k, they will have to wait for 48 hours. People can only cast a limited number of delete votes a day (5 for 10k users, 15 for 20k users). A question needs at least 3 delete votes. More if it is heavily upvoted, or if its answers are. Again, deleted posts are still visible if you have the rep. In your case, the question got shot down by three 20k users within three hours of getting posted. Perhaps they should have been less trigger-happy, but again, that is really quite a coincidence, seeing how we only have nineteen 20k users in total (of which at least two are inactive, and another three are mods, so they don't really count). Lastly, your question also has two undelete votes as of the time of this writing. So it only needs one more vote to get undeleted. However, my personal advice would be to actually repost from scratch, in this particular case. It really is a completely different question after your last edit, and it will probably become different still if you edit it yet again. As to your last concern, no, simply re-asking one deleted question does not trigger immediate suspension. You will always see it coming. However, it is recommended to ask on meta first, just like you did. That's why meta exists in the first place, after all. For further reading, see this feature request (status-declined) over on the Meta meta: Show all of my question/answers to me even if they are deleted.